For the study, which now appears in Environmental Science and Technology, researchers Tracy Mincer from the Woods Hole Oceanographic Institution in Massachusetts and Linda Amaral-Zettler of the Marine Biological Laboratory in Woods Hole, used fine mesh nets to collect pieces of plastic ranging in size from 1-5 mm in diameter from multiple locations in the North Atlantic Ocean. 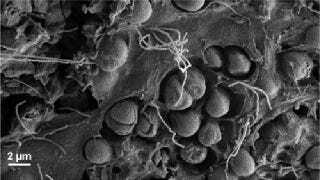 After analyzing the microbes with scanning electron microscopy (SEM) and next-generation genetic sequencing, the researchers discovered a diverse community of heterotrophs (organisms that feed off of complex organic substances), autotrophs (organisms that feed off simple inorganic substances like carbon dioxide), predators, and symbionts. It's a a rich and dynamic ecosystem they're now calling the plastisphere. And in fact, the plastic communities were more diverse — and isolated — from those in other seawater samples (which are typically dominated by only a few species). Over 1,000 species were discovered, including plants, algae, and bacteria (some of which are still unidentified). The researchers say that the plastic is acting as a veritable reef onto which the microbes are clinging. These "microbial reefs" are offering a distinct place that selects for and supports advantageous microbes to settle, succeed — and evolve. Fascinatingly, the researchers discovered so-called "pit formers" in the microbial mix — organisms that were found on certain types of resins that are actually breaking down (i.e. eating) the plastic. So it's possible that some of this plastic — which has a longer half-life than most natural floating marine substrates — is actually being degraded at a rate faster than we thought. Read the entire study at Environmental Science and Technology: "Life in the "Plastisphere": Microbial Communities on Plastic Marine Debris." Image: Zettler et al/Environmental Science and Technology.